Soup season is inarguably the best season. Sometimes, though, it seems like every recipe calls for chicken or beef stock. We compiled a list of our favorite vegetarian soups—from veggie chili to miso soup—so everyone can enjoy the most wonderful time of the year. Creamy, silky tomato soup is the ultimate comfort food. We've elevated the traditional soup with the addition of white cannellini beans and toasty garlic oil. You won't miss any of the cream or calories from this dairy-free tomato soup as the texture is still silky from blending the tomato base. Serve alongside our revamped Grilled Cheese Skillet "Panini" for a meal kids and adults will all approve of. With the addition of the white beans, each serving provides 8 grams of protein making this vegetarian meal foolproof. Tomato soup gets a flavorful new twist: Roasted eggplant adds creaminess, and caramelized onions and carrots add sweetness. Soups are the most comforting dishes for fall and winter nights. But if you want to do homemade soup right, you have to spend hours letting the broth simmer or leave it in the slow cooker all day. Not anymore! You might not believe us, but this Smoky White Bean Soup is ready from start to finish in just 25 minutes. That’s less time than it takes Mama to put her face on! Not only is this recipe super quick, but it cooks in one pot. A 25-minute, one-dish recipe that’s comforting and filling is a winner in every sense of the word. This recipe starts with one of our favorite things—bacon—but only one thick-cut slice of bacon, so make it an extra thick slice. This recipe is so easy because that you’re not chopping your time away. Pre-chopped onion, pre-chopped celery, one minced garlic clove, and a teaspoon of chopped fresh thyme are next in the pan, and they cook right in the bacon drippings. Talk about yum. Add chicken broth, cannellini beans, one chopped and seeded plum tomato, one bay leaf, salt, and pepper, and you’re done. Really, we wouldn’t lie! This soup only simmers for eight minutes after it’s brought to a boil, and it’s ready to eat. This recipe is so easy to whip up the fastest lunch or dinner ever, and you can make it ahead to take to work for the most comforting brown-bag lunch in the office. Marsala, a fortified wine from Sicily, gives this slow cooker soup recipe its wonderful flavor. Feel free to substitute sherry for a similar effect. Looking for a meatless meal that still satisfies? Try this filling soup loaded with pasta, beans, and vegetables. Swap out the tortellini for refrigerated ravioli if you prefer. 7 Fast and Filling Soups: Perfect for fast days, cook these meals, and then take single portions. Lose weight the 5:2 way. This healthy recipe is featured in the soups section of the new 5:2 Starter's Guide to The 2-Day Diet. The book provides a selection of over 100 tasty recipes to help you meet the daily 500 calorie allotment for the 2 days of intermittent fasting, as required by the 5:2 Diet. Think of this as "new and improved" borscht, with fruit and mint added for freshness and subtle spices for intrigue. If you like, roast extra beets to eat later in the week; they keep several days in the refrigerator. Blend everyone’s favorite low-carb spud with floral lemongrass, fresh ginger, and creamy coconut milk for a Caribbean dish to warm even your coldest winter nights. Ladle into dark bowls for a bold contrast to the sunset-orange color (thanks, turmeric! ), then give it a Pollock-like drizzle of coconut cream. 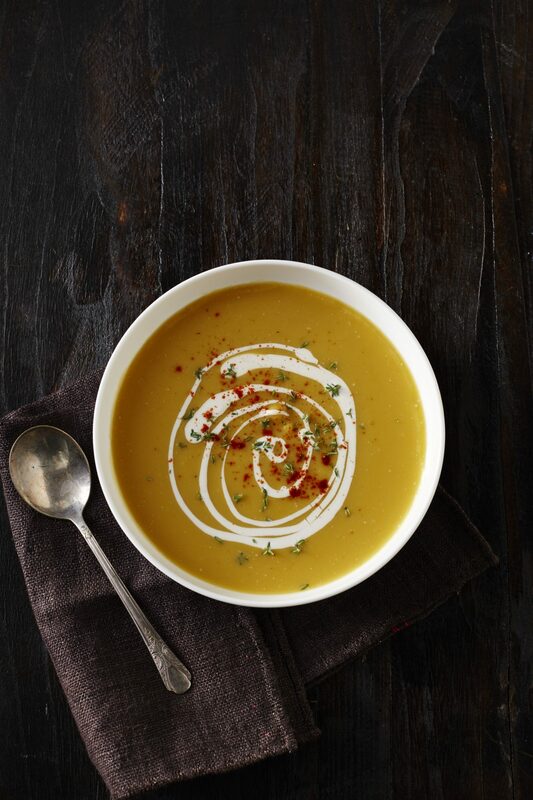 Even without added cream, pumpkin soup takes on a velvety texture after it's simmered and pureed. Make sure all the ingredients are very tender so they'll blend together smoothly. Simple toppings like salty-sweet pepitas make them a little more special. For a fun, no-fuss garnish, top with 2 tablespoons popped popcorn. Sprinkle with freshly ground black pepper, if desired.